In Mississauga, a city of more than 700,000 people, 80 percent of the community was immersed in the darkness, according to power distributor Enersource. However, by roughly 10 p.m., only about 50,000 residents were without power. Environment Canada explained that certain parts of the GTA have been drenched with over 100 millimeters (mm) of rain. The previous one-day rainfall record was 29.2mm in 2008, and the monthly average for July was 74.4mm. While Toronto’s downtown core was covered with abandoned vehicles, water from flash flooding poured out of the sewer drains. 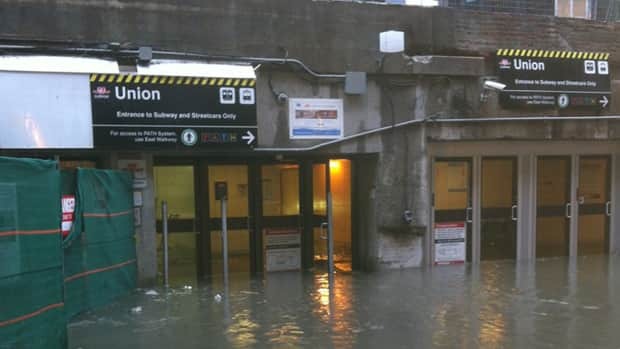 Drivers weren’t the only ones left to deal with the aftermath of the severe thunderstorm, all of Toronto’s subway service was temporarily unavailable due to power and signal issues as well. Many stations were also flooded, but partial service eventually resumed. However, large parts of the system remained shut down. Additionally, Go Train commuter service was also disrupted, due to portions of the track flooding along the western Lakeshore and Richmond Hill lines. A rush-hour train got stranded in the floodwaters while making its way up north to Richmond Hill. The floodwaters rose up to the lower windows and spilled through the bottom floor of the carriages, sending riders scrambling for dry ground. A passenger, Jonah Cait, tweeted: “There’s a full-on river on either side of us… We. Are. Stuck. Hard.” A spokeswoman for Metrolinx, Vanessa Thomas, said the power was shut off and windows cranked open to allow for ventilation on the double decker train, which carries up to 1,900 commuters during the regular evening rush. Three and a half hours after the train became stuck, the Toronto police marine unit floated out in rescue boats to remove passengers through the windows. Those travelling by ground weren’t the only ones who were affected; the flooding caused air travelers to be distressed as well. Around 7 p.m., Porter Airlines tweeted that due to the power outages in the terminal, it had cancelled all flights out of the city’s downtown airport for the rest of the evening. Even Pearson Airport’s website was damaged by the flood, as their computer server room was soaked. The Don Valley Parkway was also partially closed, because the Don River’s banks were at risk of collapse. Provincial police have warned drivers to stay away from parts of Highways 427, 27, and 401 due to flooding. Toronto residents have been advised to stay home whenever possible, and avoid driving as well. Is your business continuity strategy up to date? We can help ensure your business has a backup and disaster recovery strategy in place. Call us to book a no obligation review of your business continuity strategy.